Have you been searching all over for Mr. Right, but keep being disappointed by the men you meet? Do you wish you there were a way you could find that perfect person for you without dating the wrong people? 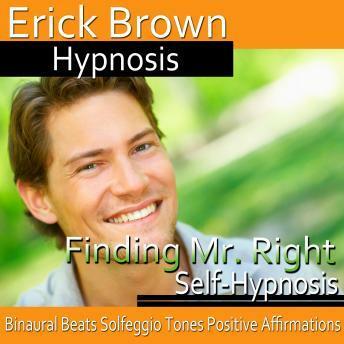 You deserve a man who you can connect with you on every level, and it's time to find him with the help of this hypnosis program from Erick Brown. Let "Finding Mr. Right" help you release from negative thinking and self-doubt about relationships, and help you embrace positive thinking, self-confidence, and openness. Suggestions for deep relaxation and positive change will be received by your subconscious, increasing your self-esteem, keeping you open to love, and helping you to attract the high-quality kind of man you've always dreamed of. Why wait another day? Mr. Right is just around the corner, waiting to build an incredible relationship with you. - one containing a speed induction that will quickly take you into a deeply relaxed state. Use this track if you are already familiar with the relaxation process and would like to quickly move into deep relaxation. -This soothing bonus track can be used with your hypnosis program or on its own for a deep, restful sleep. Binaural beats and solfeggio tones relax your brainwaves and body, melting away tension and stress.